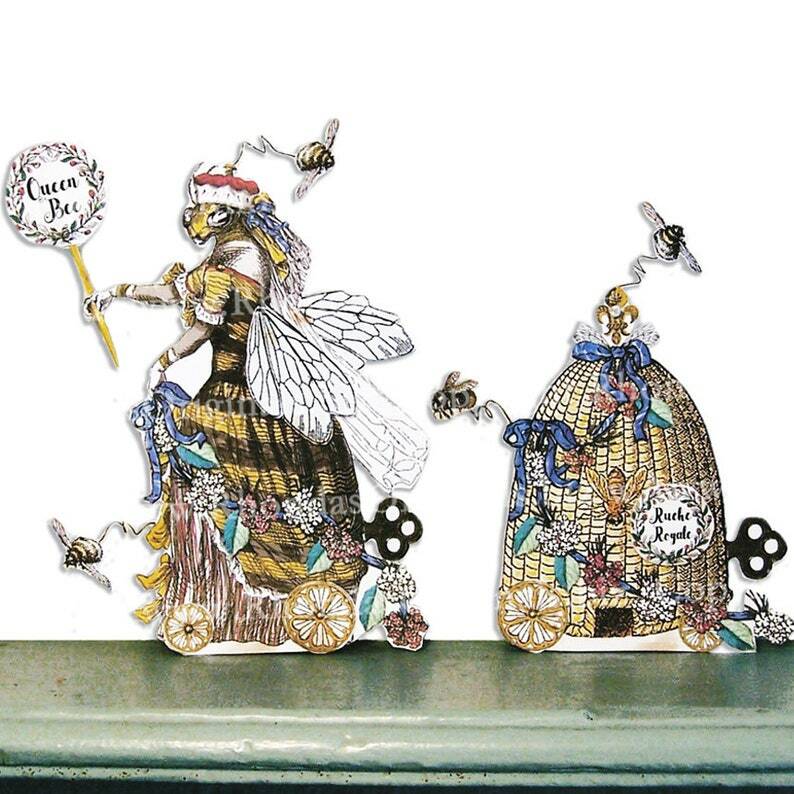 This 3-piece Queen Bee and Bee Hive paper doll digital download is one of the characters that makes up my Flower Paper Doll Parade. This Queen Bee in Photo 2 has a Jane Austen style Regency dress. Simply print out in color, cut, assemble per my instructions, and stain the card stock character with coffee to make it look like an actual antique! FP04 - Clarissa, The Wasp thinks she is pulling a fast one by impersonating Wilhelmena, the real Queen Bee of the Flower Parade. She's dressed in a striped bumble bee dress and is traveling down the parade route with the Royal Hive. The real Queen Bee, exasperated by the trick, follows behind on her throne (photo 2). Some parts dangle on wires. Arm moves on brad. Wheels spin. BUYER NOTES: Digital downloads are not returnable. See my policies before purchasing. Includes .jpg format with a how-to pdf.. I own the copyrights. These digital files cannot be resold or shared with others. Send your friends here to purchase their own copies. You cannot sell printouts of the files either. You can print out the dolls, assemble them, and then sell the finished 3D product on a small scale.